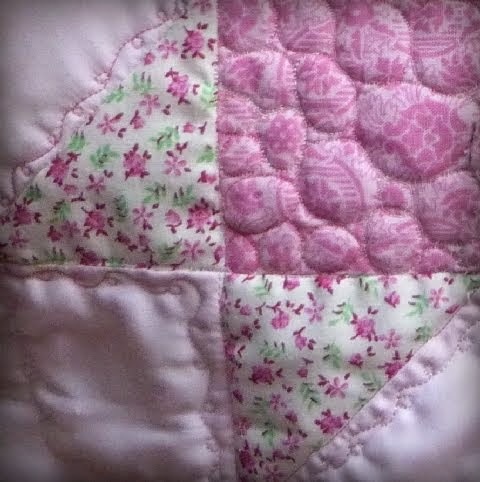 I wanted to share a little something I do quite often at my sewing machine that other quilters might find helpful having to do with marking the quilt. Since I've been free-motion quilting exclusively of late, and I hate marking, I always try to keep it minimal. But there are times I like to draw onto my fabric to guide my quilting. Often times, I make mistakes, thus this quick tip. First of all, I usually use a blue marking pen, where lines disappear when wet. Near my sewing machine, I keep a jar filled with pens, pencils, markers, and a paint brush. I also keep a spray bottle close at hand. When I finish a block, a quick spray erases the marking lines and reveals all that beautiful quilting. There are other uses too, such as moistening a paper towel to clean up lint or one of my favorite uses--to discipline a wayward kitty doing something she shouldn't. Fortunately, we're at the point now where just picking up the spray bottle is enough to make her stop the naughty business. Who says you can't train a cat? HERE'S THE QUICK TIP} I use the spray bottle to make a tiny puddle on the surface of my cutting board or in my case, the counter top. I dip the paint brush into the puddle and 'erase' any lines I've marked in error. It is so easy to make a mistake when 'drawing.' This makes it really easy to fix it without soaking the fabric and having to wait for it to dry. So little moisture is needed to erase the mark that it doesn't cause any delay in getting back to sewing at all. By using a paint brush, only the line is wet, so it is no problem to mark correctly since the spot where the marking should be remains dry.